The following is the text of the poem by Rivka that I read at her erev zikaron on Monday night. The following is the text of the essay by Rivka that I read at her erev zikaron on Monday night. Change occurs, whether we are ready for it or not; and we are usually not prepared. Such is the case with graduating from college (which I did three months ago)... and making Aliyah (lit. moving up; i.e., moving to Israel) (which I am about to do). I have dreamed about Aliyah for as long as I can remember. Yet, dreaming about Aliyah is a very different process from actually moving to Israel. Most events are easy to prepare for in the abstract, or when they are far away. When I originally tried to gather information about what I would need to do, I was continually told "it's too early for the kind of preparations you're talking about." Suddenly, it's no longer "too early" and I have more preparations than I have time for. I'd better get used to it. My Aliyah is this summer. Aliyah is a big change. Though I have been waiting for this time since I was six years old, I am hardly ready for it. A friend recently asked me if I had any fears about the upcoming event. "Are you kidding," I responded in amazement, "I'm terrified!" Being idealistic does not prevent one from being aware of the realities, and the realities of Israel are tough ones. In addition to the difficulties faced by other Israelis, American Olim (new immigrants) face problems that are particular to their situation. Olim have to learn a new language, literally and figuratively. Learning Hebrew is easy compared to learning to understand some of the more subtle (and sometimes not so subtle) nuances of the language of society. In addition, Olim have to learn an entirely new set of rules about how their society is run. Moreover, they have to confront life's problems without the day-to-day support of their family and life-long friends (unless the newcomer is one of the priveleged few whose families and friends have also made Aliyah... most of us are not that fortunate). While Aliyah is perhaps the greatest upcoming transition in my life, many of the changes I am currently experiencing have nothing to do with it. Rather, they are the normal ones that come as a result of graduating from college and beginning a new life. Graduating from college and entering "the real world" is, in and of itself, extremely intimidating. All of a sudden, the previously sheltered young adult is thrust into the challenges of earning a living, balancing a budget, and rebuilding a social framework. It's not easy. In addition, the intellectually challenging atmosphere of the university is replaced by a mundane world filled with mundane tasks. No longer is the world at one's front door. One has to travel everywhere: To work, to friends, to activities. When you get down to it, life in the "real world" is inconvenient and difficult anywhere, even in the United States. The hardest aspect of moving on in life is saying goodbye. We leave so much behind when we start something new: Places that we can walk through blindfolded, sounds that we hear in our sleep, sights and smells that we have grown used to. Most of all, we leave the people that mean the most to us. There are so many people that we say goodbye to. There are many people who I will not promise to write to because I know that we will not keep in touch. However, there are some people with whom I really hope to keep in contact, and I wonder... in five years, how many will I still be in touch with? It's hard to maintain the contact when you are separated by so great a distance. Visits are next to impossible and letters grow farther and farther apart; these are the facts of life. Furthermore, as our lives continue along such separate paths, our concerns also diverge. Our joys and our interests represent the different lives we lead and often become difficult for others to share and understand. More than anything else, I am torn by the fact that moving to Israel means leaving my family. I am fortunate to have a wonderful family. I am close with both my brother and my sister, and my mother and father have always been my best friends. Moving to Israel does not mean that I will lose these special relationships, however, it does mean that they will change. All of us will have to redefine our relationships with each other to meet the new restrictions of living thousands of miles apart. Telephone calls will no longer be able to run on for an hour, nor will they occur every few days; we will have to plan visits months in advance; and we will not spend birthdays and holidays together. Life will constantly remind us of the vast distances that separate us. (We will be unaware of the daily events in each others' lives.) These are the realities of choosing to live in a homeland which, in many ways, is so far from home. Although it is in the nature of things that children grow up, build their own homes, and begin their own families, there remains within all of us a part (no matter how small) that considers home to be wherever mom and dad are. Nonetheless, there are many changes that I am eagerly looking forward to. Each day that I am in Israel I will be fulfilling my dream of living in the Jewish State, on my land, with my history, my language, and my people. National holidays will be my holidays; and the state schools will teach my culture; the museums will record my people's heritage and achievements. In Israel, everything is mine, including the problems. However, equally significant is that the issues I care about changing in Israel will be mine to change. In Israel, every individual's presence makes a difference and I want my voice to be counted. Although I know that daily life there will be filled with constant challenges for me, I know that my children will feel at home within the Israeli system, and it is they who will be my future and the future of my people. It is comforting for me to see that many of my peers from college, who are working in the U.S., have also discovered that they need time to adjust to life. If it is tough for them to adapt to a new life in their native country, then it is only natural that I will have difficulties in one that is foreign. Just as they will eventually find their way in America, so too will I eventually find my place in Israel. (It would be unrealistic for me to expect that my Aliyah will be easy, since adjusting to life is not easy. At least, in the U.S., I would know what to expect.) Once I get off the plane in Israel, I will encounter a world that I barely know or understand. I will prepare for this new world as much as I can, but it is impossible to predict the turns, both good and bad, that will undoubtedly creep up along the way. The unexpected occurs everywhere... why shouldn't it happen to me in Israel? And so change creeps up on the best of us, and we have only to face it and move onward and upward (pun intended). Many of you have asked for copies of the essay and the poem written by Rivka that I read at the erev zikaron. I am posting them here, for anyone who would like to read them. Thank you to everyone who came to the erev zikaron on Monday evening. It was wonderful to be able to spend an evening together with all of you remembering Rivka. Thank you to Rabbi Chanoch Yeres, for your inspiring shiur, and for your moving recollection of the intensity and and impact with which Rivka lived her life. Thank you to Charlie Kalech and Steve Leavitt, for your help in publicizing the event. Thank you to Stephanie Glick, for your help in livecasting the event on Facebook. Thank you to Pelech, (both of our daughters' alma mater), for allowing us to use your building and auditorium, and to Tzion Halawi, the av bayit, for helping set things up and clean up afterward. Thank you to Louise Olswang Fox, for your work on The Book™ -- coming Real Soon Now! Thank you to all the volunteers who helped with refreshments, with setting things up, cleaning up, and everything else. Thank you to my wonderful and incredible wife Lisa, for your enthusiastic help and support in almost all aspects of planning the evening. Thank you to all those who came to the aliyah l'kever on Friday morning. Thank you for all for helping make a great evening happen where Rivka's spirit could be felt. And thank you to those who weren't able to come, but watched online, sent warm wishes, and/or were with us in spirit. 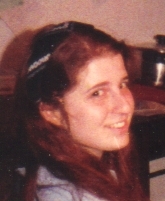 We will be holding an erev zikaron (memorial evening) for Rivka, on the evening of the eighth anniversary of her passing. "Inspiring and Educating Our Children: Action and Emotion Serving Hashem"
The following is the text of the first essay by Rivka that I read at her erev zikaron on Thursday night. It was written in America, about a year before her aliyah. I am a Zionist. Without Israel I am nothing. I am a Jew and have always been proud of that fact. That is why I am a Zionist and always will be. I am part of a stiff-necked people, not a meek religious group, but a fiercely proud nation. We were not always fierce but we have always been stubborn and we have refused to disappear. We have a country now and it's ours once again but there are those who would trade it for the golden calf. They see Israel as a place to visit, perhaps once in a lifetime, perhaps every winter. Or if there is a war, then, suddenly, these people are willing to risk their lives, or at least their money. They have nothing to lose, without Israel, their lives are lost and their money worthless. The war will come, but it will arrive too late for their money, or their willingness to die. The war will come because we have turned our backs. We, the Jews, have closed our eyes, pretending that we just don't see how much Israel needs us there now, not to fight, but to live & work on the land we claim is ours. But we are not ready to live and struggle in our land when our lives are so comfortable in a foreign land. So we suppress our love for our land and our guilt at abandoning it, and call this foreign land home and ignore all the signs that reveal the truth. We are not home, we are in the guest house and we have already overstayed our welcome. Our house had been destroyed, but now it is restored. Our hosts are already subtly hinting that it is time for us to go home. Yet our hosts are not ready to forcibly show us the door, not yet. Soon they will scorn us because we have shown that we lack pride. We have decided that we no longer need Israel to be comnplete Jews. We reject the idea that we are a nation even as we reject the idea that we are a religion. We can ignore the idiosyncacies of prayers to G-d to return us to our land even though we possess the ability to return on our own. We divide ourselves into natonalists vs. religionists even as we know that without both, which are really one, we are nothing. And we are silent even when we know that there is a need to call out. In just over one year I will be breaking away from everything that I have ever held to be of value. I am leaving the country where I have been raised, a country that I love and understand. I am leaving the people I have known since birth and the friends that I have made along the way. And I am leaving the people who mean the world to me, my family. I am leaving them because they won't come along, though I pray to G-d to make them change their minds. In some ways, I have most wanted my friends to join me. But I have only cried and prayed for my family. I need them. So how can I leave & why am I writing this? Because Israel is my home, because I am a Jew, because my parents taught me to be a Jew and because if I am not proud of who I am then I am nothing. I am not, and refuse to be, nothing. I am a Zionist.